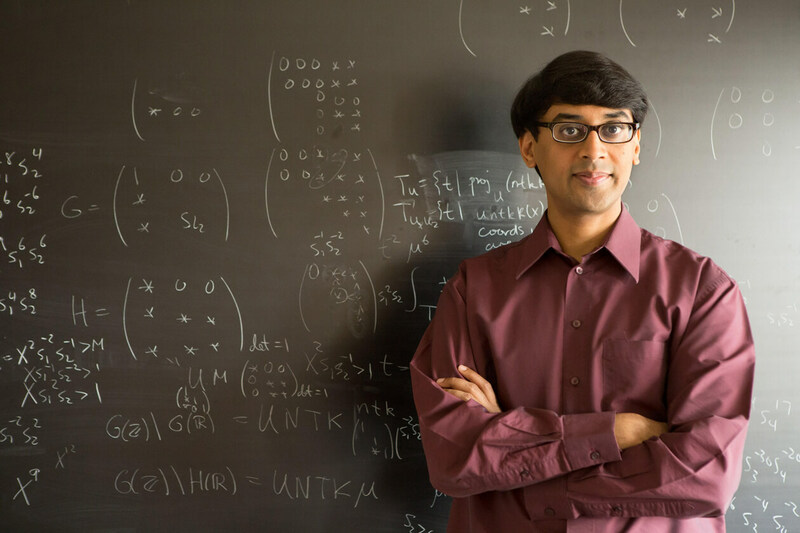 On a Wednesday evening in November 2016, Princeton mathematician Manjul Bhargava greeted a packed audience while holding a gigantic deck of cards, its dimensions equalling that of a stack of magazines. “Much of what magicians do is math, as well as sleight of hand,” said Bhargava, as he began his talk for students that night at the Fields Institute, an international hub for math research based at the University of Toronto. Two grade schoolers, Artash Nath and his sister Arushi (then ten and seven), sitting near the back, were excited to see those big cards and to find out where Bhargava’s magic would lead. As the talk progressed, Artash snuck up toward the middle of the room while Arushi stood on her chair, keen to get a better view of the action. Number theory is a branch of mathematics concerned with the properties of and relationships among whole numbers—such as 0, 1, 2, 3, -1, -2, -3—and ratios of whole numbers, a.k.a. fractions. Elementary and accessible problems in number theory, for instance, might include pondering the properties of Fibonacci numbers—a sequence of numbers that Bhargava is very fond of wherein each number is the sum of the previous two, like so: 1, 2, 3, 5, 8, 13, 21, 34 (and so on). During the day, the symposium involved heady talks on rather more advanced number theoretical concerns, steep terrain traversed by experienced mountaineers, such as Bhargava’s colleagues who had gathered from around the world. They had cleared their calendars for a week to toast their beloved ambassador—a charming, mild-mannered geek—who often betrays his enthusiasm with a slight, pacing pogo bounce. But, two nights in a row, Bhargava drew in the masses. On the first evening, at the Isabel Bader Theatre, he entertained 450 people and had them pondering “patterns in numbers and nature.” “I got interested in mathematics through the art of patterns,” he told the crowd. “Mathematics is, in large part, the search for patterns and for explanations as to why those patterns are there.” He extolled the delights of number theory in everything from the hibernation cycles of cicadas to encryption. Cicadas live for years underground and reemerge in prime-number intervals (every thirteen or seventeen years, for the Magicicada genus, for instance), and humans deploy prime numbers—“the atoms of our universe of the whole numbers,” as Bhargava described them—to protect their digital lives online. “The fact that it is easy to multiply two large prime numbers but hard to do the reverse process is the basis of much of the world’s encryption,” he said (thereby providing a critical example of the applied reach of number theory, which he noted was one of the most heavily funded branches of pure mathematics). The following night, in a lecture room at the Fields Institute, Bhargava’s magic talk gave a speedy sampling of his popular Princeton freshman seminar covering the “mathematics of magic tricks and games.” The session transformed the entire audience into students learning tricks. Everyone had a complimentary set of four cards and followed Bhargava’s lead, step by step. As long as students executed Bhargava’s instructions to the letter, the tricks would be self-working—that is to say, students would successfully execute the tricks even if they didn’t yet understand the underlying principles of number theory that made the magic work. 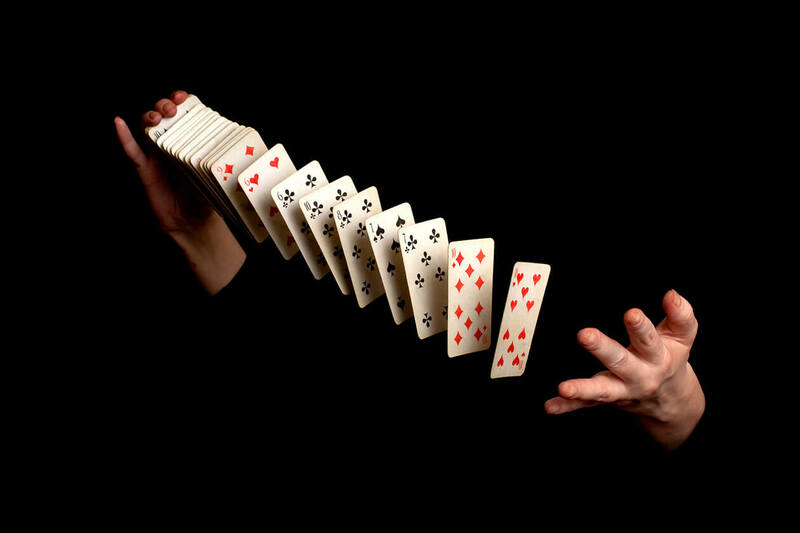 Among Bhargava’s tricks was “destroy the evidence.” First, he instructed everyone to rip their deck down the middle, thereby effectively producing two smaller decks of four cards. Then he launched into an intricate choreography of spelling-inspired shuffling that somehow matched up all the cards torn asunder. “Before you know how this trick works, it’s the most mind-blowing thing,” he said. “Once you know how it works, it’s the most elegant thing.” Working at the blackboard, he hinted that the shuffling tapped into what’s called “modular arithmetic,” thus causing the cards to realign. Bhargava’s Princeton “mathemagic” course has only fifteen spots available, though it reliably attracts more than 200 applicants, who each write an essay making their case. Bhargava believes the perfect candidate is “curious but still scared”—sometimes, applicants confess in their essays that they are mathphobic and that they hope his class will be the cure. “If they are willing to let go of it for a bit and see if their phobia is worth continuing, then I’ll take those students,” said Bhargava, who is among a relatively small fraction of practitioners in the field who devote a large amount of their time and energy to bringing mathematics to the masses. Hamilton born, in 1974, and Long Island raised, Bhargava is now—by way of Harvard—a professor at Princeton University, where he received his doctorate in 2001. He is known for his two-tiered approach to the “geometry of numbers,” a subrealm of number theory wherein, say, three-dimensional space is populated with coordinates (the space could be two dimensional, or forty dimensional, or n dimensional). But on the second tier, he’s also in tune with the more complex features that lie beyond. To extend the garden metaphor, he’s interested not only in the trellis’s criss-crossing wooden slats and their points of overlap and intersection (points highlighted with the coordinates that he’s counting) but also the intertwining superstructure of, perhaps, a trumpet vine that grows and builds upon the foundation beneath, winding its way in and out, up, around, and over into the trees. One of Bhargava’s big contributions to number theory was to identify wild, spikey, and “non-well-behaved” regions where it is especially important to understand how to count lattice points; and, more precisely, he was able to reduce many classical open problems in number theory to this exercise in counting. Then he developed techniques for counting the lattice points in these wild regions—a particular job, to be sure—thus settling (and closing) the open problems. Bhargava has a similarly two-tiered modus operandi for teaching mathematics: he has a talent for at once going high and low in excavating and communicating mathematical gems, and thereby making math more approachable. “The subjects of music, poetry, nature, and magic are in large part how I got interested in mathematics,” he says. “And so I like to try and share my experience with students and others in the general public, in the hope that that may also excite them or inspire them towards mathematics, or at the very least remove their mathphobia.” Practically speaking, mathematics is everywhere—in artificial intelligence and big data, for instance—and society would only benefit were all of its citizens to possess a baseline level of literacy. Yet a substantial subspecies of Homo sapiens displays proud indifference—if not apoplectic aversion—to what Bhargava loves most in the world, and naturally, he wishes that this weren’t the case. “Most people never get to see the beautiful side of mathematics,” he says. Bhargava fell in love with math as a kid during extended sojourns in Jaipur, his ancestral homeland. From his grandfather, a Sanskrit scholar at the University of Rajasthan, he learned not only poetry but also the mathematically governed prosody—the study of the units of rhythm and the patterns of beat in the linguistic sounds of poems. He heard the stories about the mathematician Pingala, born around 500 BCE, whose poetry contained mathematical error-correcting codes, of sorts, embedded to ensure that the metrical integrity of the orally transmitted compositions was preserved for generations. And he heard about the prosodist Virahanka who, around 600 CE, knew of the Fibonacci numbers long before their thirteenth-century Italian namesake—Bhargava prefers to call them the Virahanka-Fibonacci numbers. Bhargava incorporates these more artistic elements of his mathematical roots into almost all of his talks. He’s been known to count the spray of petals on a daisy, or the whirls on a pinecone, or, as a professional-level tabla player, to break into a drum solo—always noting the mathematical underpinnings. The number of petals on a daisy, for instance, tends to be one of the Virahanka-Fibonacci numbers, thirteen or twenty-one. And, for Bhargava, the rhythmic sequences in drumming, as in number theory, are improvisational (while following patterns), and he often turns to one when stuck on the other. After Bhargava concluded his magic show that night at the Fields Institute, there was free time for the audience to ask him questions one-on-one over pizza and pop. Enthusiasts kept him occupied for a couple of hours. Perhaps his most persistent interlocutors were the grade schoolers, Artash, who builds rockets, and his sister Arushi, who wants to be an astronaut (together, they recently created an AI project, Space-REX, designed to predict the risk of asteroid collision with Earth). They found Bhargava at the front of the room and gave him an awe-inspired grilling. “We’re a science family,” said their dad, Vikas Nath, an environment and climate-change consultant (considering another degree, in astronomy). The three of them spent the day working on a problem that Bhargava had posed the night before. The next day, Vikas Nath went to Kensington Market and bought a bucket of oranges and spent the afternoon experimenting with his kids. Then, they brought a backpack full of oranges and a notebook full of calculations to the magic night and showed Bhargava their results. They’d found a formula for a square-based pyramid, but for the triangular base, they couldn’t come up with an elegant answer. With that, the Naths went off to the blackboard, determined to figure out the math behind “destroy the evidence” and all of Bhargava’s magic tricks. Artash and Arushi got busy with the chalk, with dad looking over their shoulder, at the ready with the eraser.